Bellerofonte Castaldi was one of the most original Italian musicians of the early 17th century. Born in Modena, he was exiled because of his involvement in the assassination of the murderer of one of his brothers. A great collector, he traveled throughout Italy and Germany. He was best known as a poet rather than as a musician, but his writing, often controversial, led to his arrest and several stays in prison. He met Monteverdi, whose inspiring presence is palpable in all his texts and compositions. A talented engraver – although an amateur – Castaldi fabricated his own book of music for theorbo and tiorbino. An eccentric and original person, he left us three books of songs and instrumental pieces, some of which only exist in manuscript form. His poetic talent, rare for a music composer, is visible in his lyrics, most of which he wrote himself. Castaldi's writing, some of which is written in the Modenese dialect, takes many forms: pamphlets, correspondence, autobiography, and political satire. The most expressive of them are those that reveal his own intimate concerns: his literary, artistic and culinary tastes, his thoughts, his relationship with his family, his interests, his political and religious views, his loves and what he detests. Venice he worships, but Rome, Naples, the Pope and the Spaniards he cannot bear, Modena he hates and loves at the same time. He speaks to us, as if we were his friends, of his financial difficulties, his recurring health problems, his travels, his longings and the subjects of his enthusiasm. Some of his poems were censored by a « well-meaning » hand shortly after his death and are forever lost to us. 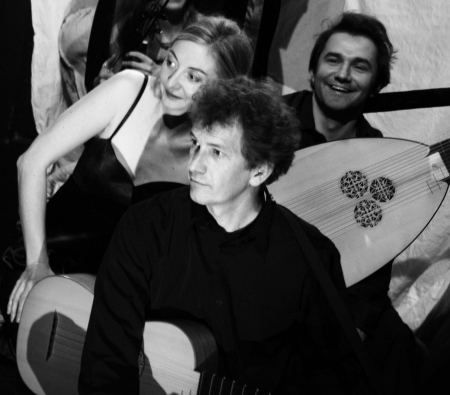 FAENZA offers the chance to meet this endearing and unique figure through a program that combines literary and autobiographical fragments with instrumental pieces, vocal monody and polyphony.